Official synopsis: Battle Lines – The battle for Ewing Energies heats up as Christopher and John Ross clash over opposing visions for the company. 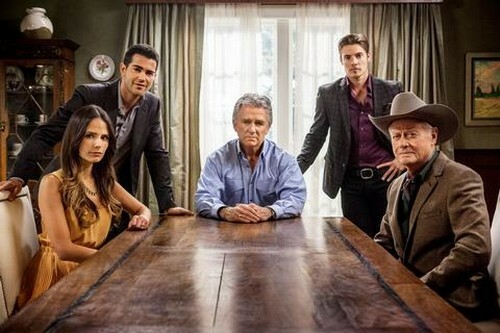 As Christopher seeks to gain the upper hand in his divorce from Rebecca Sutter, a game-changing revelation turns everything on its head, causing the entire family to put their differences aside and rally together — except for John Ross, who uses J.R.’s dirty little tricks to take revenge on Christopher and Elena. Meanwhile, Ann is blackmailed by her ex-husband, Harris Ryland, forcing her and Bobby to confront a shocking secret from Ann’s past. Venomous Creatures – With Christopher and Bobby at the helm of Ewing Energies, and Elena working to gain a stronger foothold within the company, J.R. and John Ross strike a deal to wrestle control of Ewing Energies away from them. Meanwhile, Pamela Rebecca Barnes schemes with John Ross to take half of Christopher’s shares in Ewing Energies to fulfill her father’s desire for revenge against the Ewings. And Ryland’s mother, Judith, (guest star Judith Light) proves to be just as evil as her son. 15 episodes had been filmed before Dallas star Larry Hagman passed away from Cancer. We won’t find out until episode 8 how Larry will exit the show, but the show promises a proper sendoff for our beloved character J.R.
DALLAS SEASON 2 PREMIERE LIVE RECAP HERE! Kris Jenner Gets A Talk Show, Will You Watch?